Grace O'Connor is not only an artist in her own right, but an artist who believes in inspiring creativity in young people. 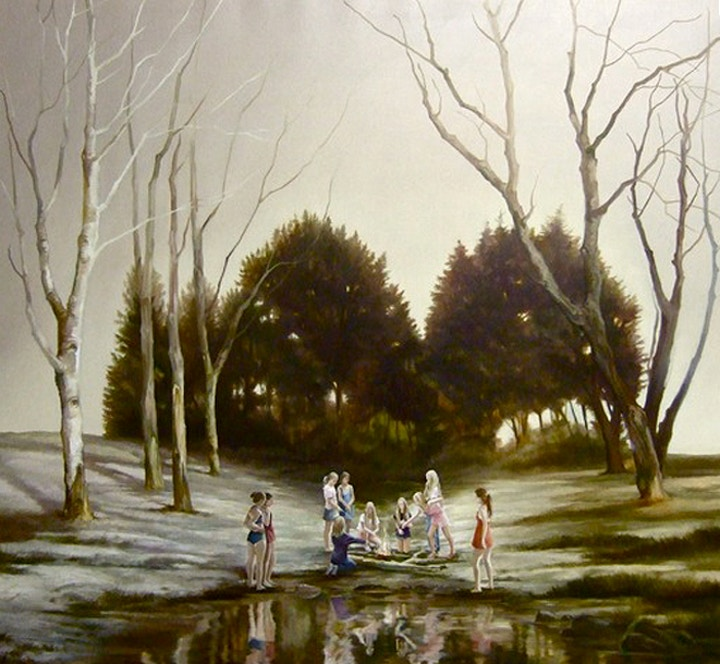 Her paintings themselves depict the teenage years of a person's life, the landscapes and emotions of growing up whilst you try to adjust to the world around you, and find the person you want to be. Represented by Paul Stolper Gallery, Grace attended the Royal Academy Schools and whilst she paints in England, she has said that her imagination remains in America. Landscapes perhaps inspired by Hampstead Heath, for example, turn into Americanised woods and meadows. Most recently, Grace has worked very closely with the schoolchildren of Hampstead Parochial on the BookBench project. 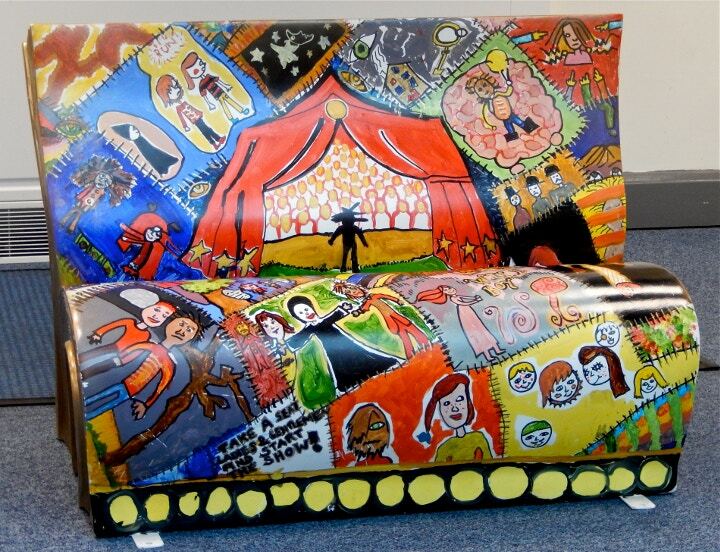 Originally a campaign set up by the National Literary Trust, where designers and artists created a bench centered around a beloved story, the project has now been opened up to schools to design a BookBench for their local area. The Hampstead children based their bench on the story 'Wild Boy'. 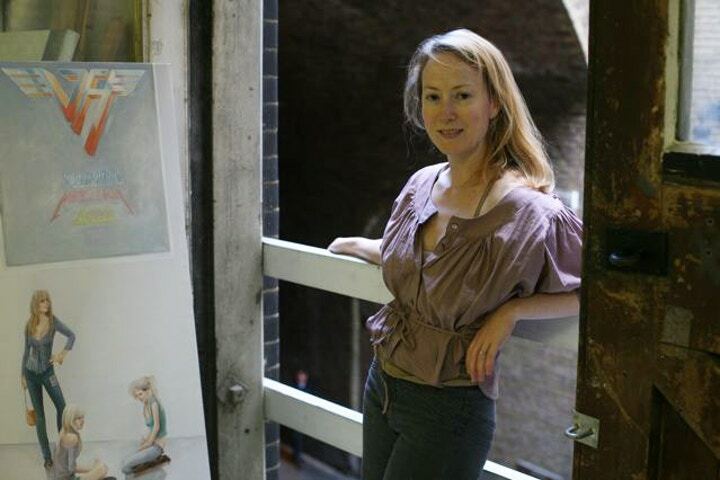 We wanted to ask Grace O'Connor about her paintings that revolve around a critical point in a person's life - adolescence - and her proactive approach in bringing art into the lives of children. Can you describe the themes behind your paintings? If I were to sum up my work in one term it would be, 'I paint teenagers.' It has been a point of reference in my work for the past twenty years. I am gripped by the time in a person's life when they are on a point of discovery and loss. When I left home in Connecticut I was a teenager and it is to this that I always return. What is it about oil and linen that you like so much? Can you talk a little about your painting process? Painting in oils allows for much more subtle layering of colour. I prefer the ability to work into the paint and smooth the surface which I can achieve in oils rather than the immediacy of the more fast drying acrylics. Linen is my ideal surface. Fine acrylic primed linen has enough tooth to the surface without feeling gritty and uneven which I never liked in cotton weave canvas. I know that art education is close to your heart, and you do a lot of voluntary teaching. Why do you think art education is so vital to society? It is unfortunate that in the national curriculum, art education is seen almost as an 'extra addition'. Children long to express themselves and art is the most vital means to do so. Every child should be encouraged to draw, paint and study art. It is how a human grows both mentally and emotionally. Being exposed to art enriches a child's mind in ways that cannot be measured on a grading scale. How can a person learn to appreciate what is beautiful in the world without experiencing art? Class 4 with (left) Ms. Stephanie McAllen and Artist Grace O'Connor (right) Photographer: Mr. Bob Speller. Can you explain a little about the BookBench project you were involved in? What did schools have to do for it? I was asked by Hampstead Parochial to assist the BookBench project. 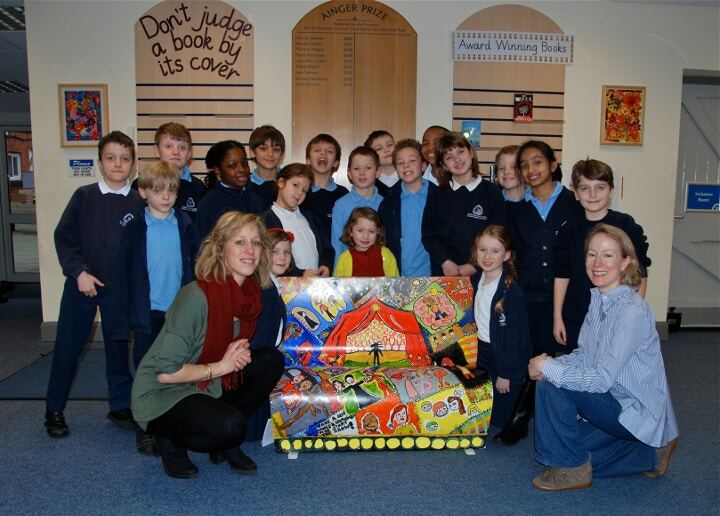 The children of Hampstead Parochial School were one of one hundred schools in London selected to contribute a BookBench through the National Literary Trust. It is a wonderful way to bring together reading and art by giving the child the chance to imagine what they envision from a story. What theme did your bench follow? And what art materials did you use to decorate the bench with the Hampstead schoolchildren? The Hampstead Parochial bench was based upon a book by Rob Lloyd Jones entitled, 'Wild Boy' which the children in Year 4 were reading. Each child was encouraged to draw an image which stood out in their mind from the story. I took the drawings and selected sections from each child's work. I then carefully drew the selected artworks, copying each style of line and image from the artworks onto the bench ensuring that they matched almost exactly the original artwork. I used a black Edding 750 Paint Marker to do so. When the line was dried I took the children in groups of five to paint their sections. Each child was given a palette, one thin brush and one thick brush and we used Daler Rowney Acrylic paint. I found it helpful to have laid out the pattern almost as a patchwork quilt to give each child their own section, thus allowing all 29 children a space to express themselves. The edges were painted with Montana Gold spray paint and finally the bench was varnished with Winsor and Newton Brilliant Gloss Spray. Incidentally, all the art materials were purchased from our beloved local Cass Art Hampstead. Do you remember any art teachers that inspired you and your own decision to become an artist? I was self taught until I entered the Royal Academy Schools, London (1996-1999). This was my first experience as an art student. It was difficult to find a way in which to work as it was an MA degree and all the students had been in the art school system for many years prior. I found that the most inspiring tutor with whom I relished any moment to speak to was Timothy Hyman RA. He is a beautiful painter but also has such a knowledge of art and can relate to the emotional side of a person's paintings while at the same time getting to the crux of a person's weaknesses and strengths. His advice was invaluable. What is coming up next in your own practice – any shows or events that people should look out for? Unfortunately as many artists in London are aware, studio space is few and far between. I had been working for the past 15 years in a studio on Clink Street but as this area is rapidly being developed, the building is closing down. I am now seeking a studio space which is proving to be almost impossible! My next exhibition will be with the Paul Stolper Gallery in London but as I have yet to relocate to a new studio, I expect there will be a long delay in preparing the new paintings. In the local area? Visit Cass Art Hampstead to shop for your own art materials. 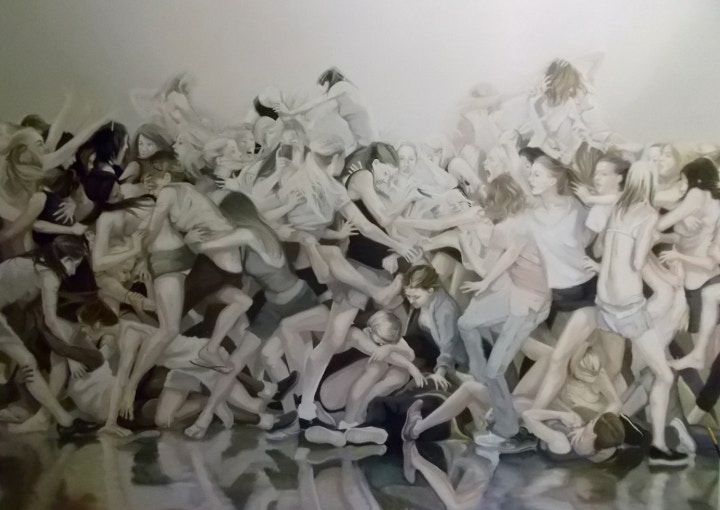 You can find out more about Grace O'Connor's work on her website here. Are you passionate about bringing art into children's lives too? If you are an Artist Educator, you may well qualify for our Viridian Card, available to art teachers across the UK. Apply for the card here.